Wednesday, we caught some clips of the action in all the different play areas! In the Big Roll, Blue and McGee were caught by the "pup-arazzi" neckfighting playfully. In the Medium Roll we spotted Hunter playing with Louie. You can also see Niko playing with a black dog who is hard to recognize against the dark floors as Annie. Ball-time upstairs was as exciting as ever, with all the little guys joining in for a romp. Thursday morning we welcomed Gherie in for his assessment. 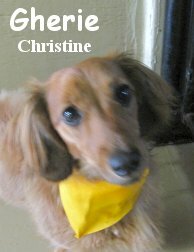 He is a one year old, fourteen pound, Honey/Dapple colored, Miniature Longhaired Dachshund (Say that ten times fast!). Gherie's original name (from the breeder) was Bagheera, named after the panther in the Jungle Book (a collection of stories written by Rudyard Kipling. Many of us our more familair with the Disney Film ;). Bagheera's owners then shortened it to Gherie, how cool! He wasted no time upstairs in the Little roll. The more dogs that came into the play area, the happier Gherie became. He played up a storm and made friends fast. Way to go today Gherie, you are welcome back anytime. 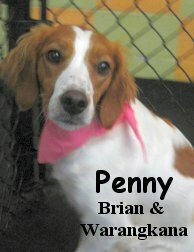 Today, we had another dog come in for an assessment-- a Brittany Spaniel named Penny. Brittanies are bred primarily for bird hunting, and her owner let us know that she has all of those instincts. She loves to chase things, whether they be rabbits, birds, bicyclists, joggers, or even cars! We also hear that she can be quite the escape-artist- we'll have to look out! We'll be seeing both of the "newbies" back next week. Here's hoping that this blog sticks!